Say you are a globally distributed enterprise with thousands of branches. Each branch has it's own user store and manages it's own users. Also, each branch hosts it's own web applications. 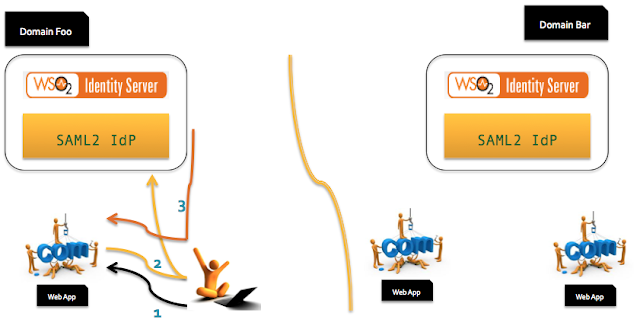 The questions is, how to enable single sign-on across branches in a highly scalable manner. 1. User in Domain Foo tries to access a Web App in the same domain. 2. Web App finds out that the user is not authenticated and redirects him to the SAML2 IdP in the same domain. 3. SAML2 IdP finds out that the user does not have an authenticated session and prompts him to authenticate. Once authenticated SAML2 IdP will redirect the user to the Web App with the SAML2 Response. And also writes a cookie to the user's browser under the Foo SAML2 IdPs domain. 4. Now the user from Domain Foo tries to access a Web App in Domain Bar. When the request to the Domain Bar initiated from the Domain Foo, a proxy in the Domain Foo adds a special HTTP Header [federated-idp-domain] to indicate from which domain the request being generated. 5. Web App in Domain Bar finds out the user is not authenticated and redirects to the SAML2 IdP in it's own domain [Domain Bar]. 6. The SAML2 IdP in Domain Bar figures out that the user does not have an authenticated session and also reads federated-idp-domain HTTP Header and finds out from where the request was initiated and redirects the user to it's own domain - Domain Foo. Here the Domain Bar IdP creates a SAML2 Request and sends that to the SAML2 IdP in Domain Foo. 7. Domain Foo IdP checks whether the user has an authenticated session. By the cookie, Foo IdP finds out that the user is already authenticated and sends back a SAML2 Response to the SAML2 IdP in Domain Bar. 8. Bar IdP validates the SAML2 Response and redirects the user back to the Web App in Domain Bar. Now the user can log in to the Web App. Bar IdP also writes a cookie to user's browser under it's own domain. 9. Now the user from Domain Foo tries to access another Web App in Domain Bar. When the request to the Domain Bar initiated from the Domain Foo, a proxy in the Domain Foo adds a special HTTP Header [federated-idp-domain] to indicate from which domain the request being generated. 10. The Web App in Domain Bar finds out the user is not authenticated and redirects to the SAML2 IdP in it's own domain [Domain Bar]. 11. The SAML2 IdP in Domain Bar figures out that the user has an authenticated session, by checking the cookie which it wrote in step-8. User will be redirected back to the Web App with the SAML2 Response. Now the user can log in to the Web App. With this pattern, each SAML2 IdP in each domain will trust each other and will register with each other. Each Web App in a given domain will only trust it's own IdP - and only needs to register with it's own IdP.